the top richest female musician in Nigeria. This article contains the current estimated net worth of Chidinma this year and some other quick facts such as her,biography,age,relationships and some other facts about Chidinma that you probably never knew. 1. Chidinma was born Chidinma Ekile on the 2nd of May 1991 in Ketu, Kosofe, Lagos State Nigeria. She has 6 siblings,Chidinma hails from Imo State. 2. The petite musician's sojourn to fame began after she won the third season of Project Fame West Africa back in 2010. 3. Some of her hit singes include "Jankoliko","Emi Ni Baller","Carry You Go", "Kedike" etc,she was the first female musician to reach number 1 on the MTV Base Official Naija Top 10 chart. 4. The Afropop singer has been in the industry since 2011,however she started singing at the tender age of 6. 5. Chidinma is currently studying sociology at the University of Lagos. 6. Chidinma signed an endorsement deal with MTN Nigeria in 2013. 7. She won the "Best Female West African Act" at the 2012 Kora Awards. 8. Chidinma's awards include Best Pop Extra Video and Kora Awards for the Best Female West African Act for her hit single titled "Kedike". 9. Chidinma's record label is called Capital Hill Records,her first album titled 'Chidinma' was released in 2012. 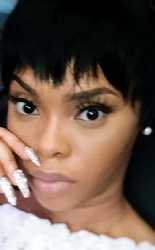 Q: Chidinma Current Net Worth? Chidinma is estimated to have a current net worth of $1 million dollars.